The flavor combination of salty and sweet along with the creaminess of the cheese is terrific. 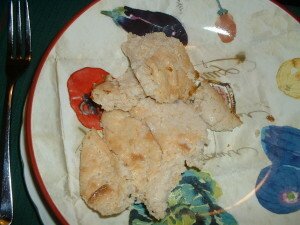 If you cannot find naan bread in your local supermarket, pita bread will work fine. Peel the outer skin from the onion. Slice the onion in half. Cut the onion into about 1/4 inch wide slices. Put a saute pan (large enough to hold the sliced onion) on medium heat. After four minutes, add the olive oil and the sliced onion. Cook the onions while stirring frequently for about thirty minutes. After the onions have been cooking for ten minutes, add the sugar, the sea salt, and the black pepper. The onions are fully carmelized when they attain a brown color. If the pan becomes too dry and the onions look like they are burning, add some cold water to the pan and stir. At this point, add the balsamic vinegar. Continue to cook for one minute while scraping the bottom of the pan to release any of the brown bits that have accumulated. Preheat the oven to 375 degrees. Place an equal amount of the carmelized onion and the kalamata olives on each naan bread. Top each pizza with four slices of mozzarella cheese. Bake in the oven until the cheese has melted and is bubbly. Let the pizzas cool for five minutes before serving. 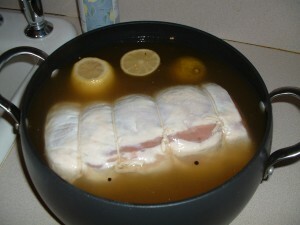 Combine the cold water, 1/2 cup of brown sugar, 1/2 cup of sea salt, the whole garlic clove, the tablespoon of sliced onion, the ginger, the whole black peppercorns, the mustard seeds, the rosemary stalk, and the thyme sprigs in a pot large enough to hold the brining liquid and the hens. Squeeze the orange directly into the pot and then add the orange halves. Bring trhe mixture to a slight boil while stirring frequently. Turn the heat off and let the brining liquid cool down to room temperature. After the liquid has cooled, add the hens to the pot. 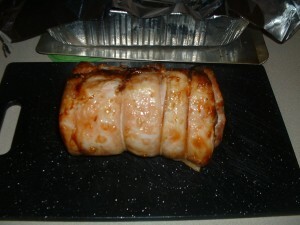 Cover and refrigerate for at least 24 hours. Remove the hens and pat dry them with a paper towel. Combine the olive oil, the diced celery, the diced onion, the minced garlic, 1/2 teaspoon of sea salt, and 1/4 teaspoon of black pepper to a saute pan. Cook on medium low heat while stirring frequently for three minutes. Combine the crumbled corn bread, the sauteed vegetables, the beaten egg, and the chicken stock in a mixing bowl. Using your hands, mix well. Divide the stuffing in half. 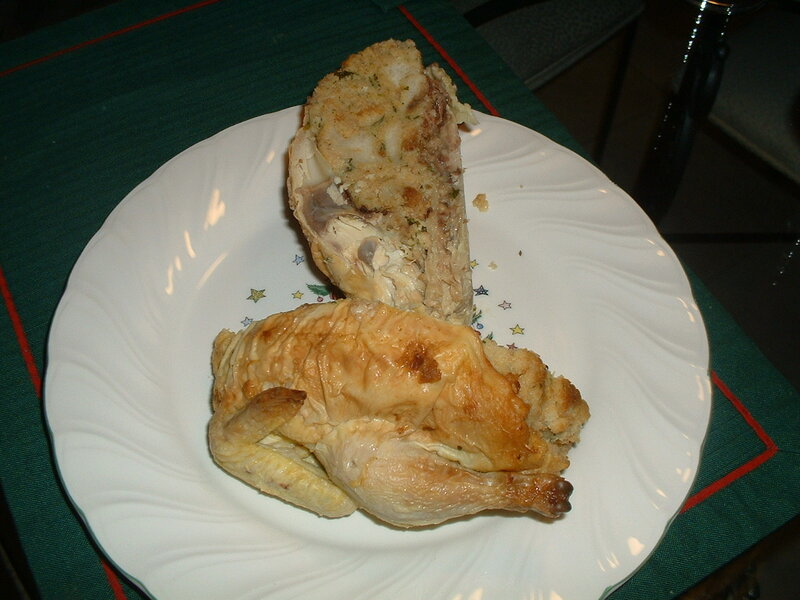 Place half of the stuffing in the cavity of each bird. Place the stuffed birds in a roasting pan. Roast the hens in the preheated oven for 1 1/2 hours or until the juices run clear. Let the hens rest for at least ten minutes before serving. I served these delicate, fluffy pillows of pasta with marinara sauce and grated cheese. Preheat the oven to 325 degrees. Rub the potatoes with the olive oil and sprinkle them with 1/4 teaspoon of sea salt and the ground black pepper. Bake the potatoes in the preheated oven for one hour and fifteen minutes. Peel the potatoes when they are lukewarm amd mash them well with a fork. Place the mashed potatoes in a bowl. Make a well in the center of the potatoes and sprinkle the potaotes with 3/4 cup of the flour. Mix the beaten egg with the nutmeg and 1/4 teaspoon of sea salt. Place the egg in the center of the well. Using a spatula, stir and fold the egg into the potatoes and the flour. This will produce a light crumble. Once the egg is mixed in, use your hands to gently knead the dough into a ball. Add more flour, a little at a time, until the dough has the consistency of Play-doh. Using a floured rolling pin on a clean surface that has been sprinkled with flour, flatten the dough to about 3/4 inch thick. Cut the dough into one inch strips. Roll the strips into logs about 3/4 inch in diameter. Cut each log into about one inch long pieces. Using a fork, lightly press the gnocchi with the back of the fork while pinching the ends to create ridges. These ridges will hold the sauce after they have been cooked. Line a sheet pan with parchment paper and place the gnocchi on the pan. Cover the gnocchi with plastic wrap. 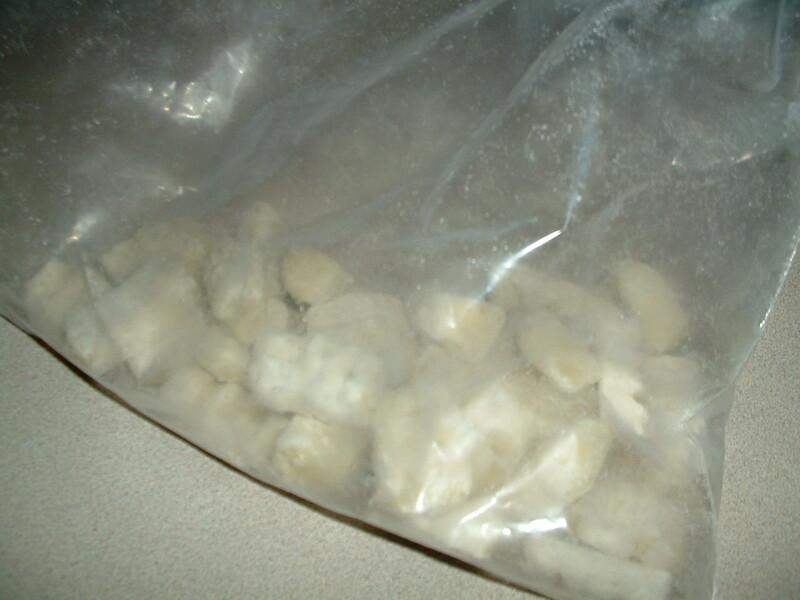 Freeze the gnocchi until they are rock hard. Now you can place the gnocchi in a plastic bag and freeze them for future use. 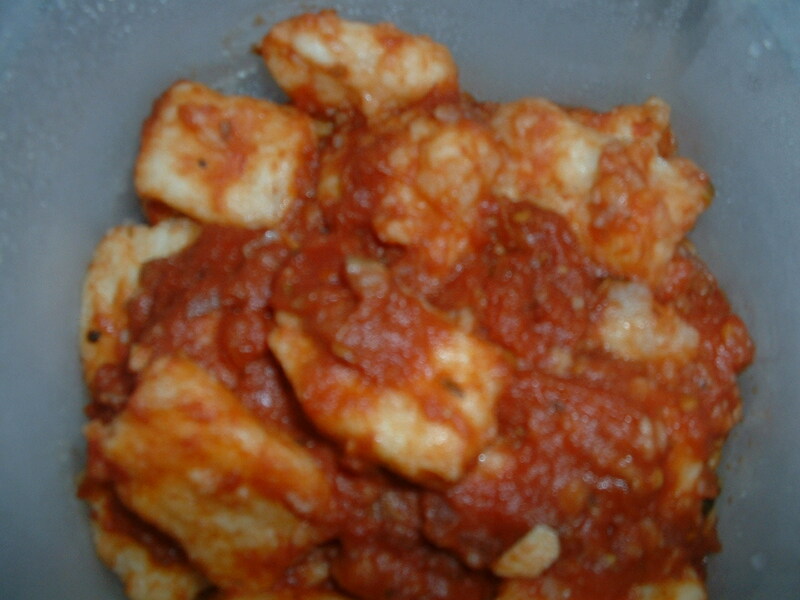 Cook the gnocchi in a pot of boiling, salted water until they float to the top of the pot. Serve with butter, pesto sauce, or a tomato sauce. Like so many of my recipes, I needed to find a use for an ingredient that I had on hand. In this case, it was evaporated milk left over from a Thanksgiving cake recipe. Whisk the egg and the evaporated milk together and set the mixture aside. Add the cold water and a teaspoon of sea salt to a pot and bring the water to a boil. Slowly add the grits to the boiling water while whisking. When the grits have been incorporated, turn the heat down to low. Cook for 15 minutes while whisking occasionally. In the meantime, preheat the oven to 400 degrees. Apply cooking spray to a shallow baking dish large enough to hold the grits. After 15 minutes, turn off the heat under the grits. Add the red cayenne pepper, the butter, and the grated cheese to the grits and stir well. At this point, it would be a good time to taste the grits and add more sea salt, as needed. Add about two tablespoons of the hot grits to the egg and evaporated milk mixture and stir well. This will temper the egg preventing it from scrambling. Now add the rest of the egg and the milk mixture to the grits. Stir well and pour the contents into the greased baking dish. Bake in the preheated oven for 45 minutes until a crust forms on the top and around the sides of the dish. Let the baked grits cool for 5 minutes before serving.